Dr Anthony Mbonye sought court redress to save his job. File photo. KAMPALA–The wrangles in the Ministry of Health seem to be increasing by the day. 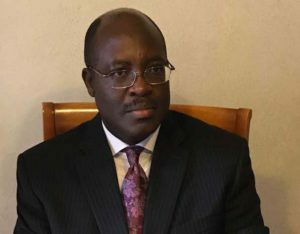 Early this week, the acting director general of health services, Prof. Anthony Mbonye, ran to court protesting a move by the Health ministry permanent secretary, Dr. Diana Atwine, to have him fired over integrity issues. Mbonye, who is a professor of medicine and obviously more senior to Dr. Atwine in medical circles, petitioned court to help him secure his job after Atwine ordered that he vacates office, basing on the recommendations of the IGG over his integrity. 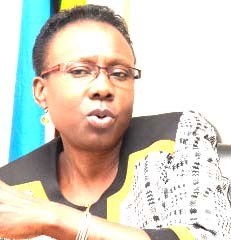 In her investigations, Justice Irene Mulyagonja accused Mbonye of conflict of interest when he determined the person specifications for the position of the director general of health services, a position he was interested in and applied for. The IGG’s probe follows whistle blower’s complaints, accusing Mbonye of conflict of interest. Health minister Jane Ruth Aceng. File photo. According to IGG, Mbonye was not fit to be shortlisted for the position, insisting that he should have relinquished his current senior position before applying for the job of director. This week, the High Court temporarily blocked the action, until the case is heard. With so many donor-funded health projects at the ministry, a highly placed source told PML Daily that wars are inevitable. “Mbonye is a highly qualified person and other ministry officials feel inferior working with him. They fought Asuman Lukwago, the former ministry permanent secretary, until the President gave him another job,” a source revealed this morning. A source also alleges that their main scheme is to steal money meant to buy drugs for patients with cancer, HIV/AIDS and malaria. “They steal the money from the National Medical Stores by colluding with Quality Chemicals and over inflating drugs, supply few to health facilities and share the balance,” the source said. “Anybody who is seen to interfere with this scheme will be hounded and thrown out at all costs using police where Kamabare is a commissioner of police and they commonly use Diana’s militia the so called the “health monitoring unit,” the source added. This confirms the silent battle between Mbonye, the Health minister Jane Ruth Aceng and Atwine. On Monday this week, an internal memo was issued by Atwine ordering Mbonye to immediately vacate office. Atwine ordered Mbonye to return to his previous position as the Director of Health Services (Clinical and Community). This is not different from the battles Lukwago fought. Though Atwine was at that time head of the State House Medicines and Health Service Delivery Monitoring Unit, those closer to Lukwago accused her of masterminding the battles against him (Lukwago). At one time, Atwine and Lukwago openly clashed in Parliament, when she criticized the rot in the Health sector and she referred to Mulago Hospital as a health facility in shambles. Health ministry Permanent Secretary Diane Atwine. File photo. When contacted, Mbonye did not have kind words for Atwine and Acengm, saying they are battling him because they have inferiority complex. “I am senior to them in the profession yet they are my bosses. Because of inferiority complex, they want me to leave,” Mbonye revealed. Aceng, however, denied involvement in the battles with her colleagues at the ministry. Atwine is also involved in an open battle with another senior official at the ministry. Recently, Atwine ordered the Police to arrest Dr Sam Kamba Baleke, the senior planner at the ministry whom he accused of being an imposter. Police picked Baleke from his office and took him to Wandegeya Police Station. His computers and mobile phones were also confiscated. Atwine said Bakele was arrested over embezzling Shs50m. But Baleke appeared in the Court of Appeal and he was exonerated. However, Atwine insisted that someone who abused the public funds cannot work at the ministry. Many senior staff at the ministry have resigned in protest.These include Dr. Jacinto Amandua (commissioner Clinical services) , Andrew Abunyang (Commissioner human resources) and Dr Paul Kaggwa (commissioner community health). After attending several meetings where the two powerful ladies reportedly insulted staff, the newly posted assistant commissioner accounts asked for immediate transfer. Dr Jim Arinaitwe, the coordinator for Global Fund projects, refused to renew his contract citing harassment from the minister. Dr Vincent Bagambe also refused to renew his contract citing harassment from the minister. Johnson Musinguzi the procurement officer asked for immediate transfer and was transferred to the Ministry of Agriculture. Mildred Bahemuka also asked for immediate transfer to another ministry. As a result of their harassment, an insider said more senior staff are considering leaving the ministry to join other organisations. “There is low absorption of funds, staff are demoralized and there is a slow sit down strike. Staff speak in whispers, already two camps are established at the ministry; the balokole, non balakole, the pro- Atwine, pro-Jane Aceng and pro-Sarah Opendi camps,” the source said. Stories are told of how they held night meetings to join balokole in order to capture the heart of the first lady and the President. They had to get close to Pastor Lwere. Some policy analysts are blaming President Museveni for appointing junior officials to run big offices at the ministry. “Because of politics, the President appoints junior people in the profession to run big offices. He picks them from the hospitals. Do you expect highly qualified officials at the ministry to respect them? I doubt,” a senior policy analyst argued.